This test is a non-invasive examination used to visualize the coronary arteries in order to assess whether there are blockages or restrictions of flow of blood to the heart. This type of technology is revolutionizing the way patients with chest pain are treated and over the past few years has grown into a more established technology that can provide accurate assessment of coronary artery disease without some of the inherent risks associated with the more invasive alternatives such as cardiac catheterization. Prior to the CT scan, you will be given some medication that will slow your heart rate. 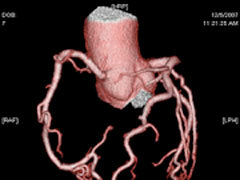 This facilitates imaging of the heart and coronary vessels. When you arrive to the CT room you will lie on your back on a padded table. The technologist or nurse will start an intravenous (IV) line so that contrast material can be injected during the CT scan. You will be connected to equipment that will monitor your pulse allowing the equipment to scan when contrast reaches your heart and to eliminate heart motion from the CT images. The table will move into the CT scanner, at which time you will be asked to hold your breath for several seconds as the IV contrast is injected and CT images taken. When the contrast is injected, you may notice a warm, flushed sensation and a metallic taste in your mouth for a short time. The CT scan takes about 30 minutes, and you will be asked to stay another 30 minutes for observation. You should wear comfortable, loose-fitting clothing for your exam. You may be asked to change into a gown and remove earrings, eyeglasses, dentures, hair pins and clothing containing metal, which could interfere with the CT image. You should not consume caffeinated products after midnight, and should not eat or drink anything 4 hours prior to your appointment. You may take your regular medications in the morning of the exam, with small amounts of water. Please inform you physician if you are allergic to any medications, are diabetic, or have renal disease or if you think you may be pregnant. If you have a known allergy to IV contrast material, your doctor may prescribe medications to reduce the risk of an allergic reaction.